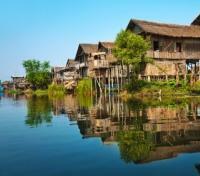 Glide past stilted Shan villages in Inle Lake. 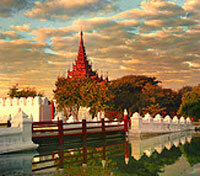 Visit the spectacular temples of Mandalay. 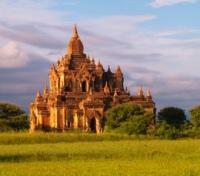 Explore the ancient temple ruins of Bagan with a private guide. Sip cocktails as you relax on the powder-white beaches of Ngapali. 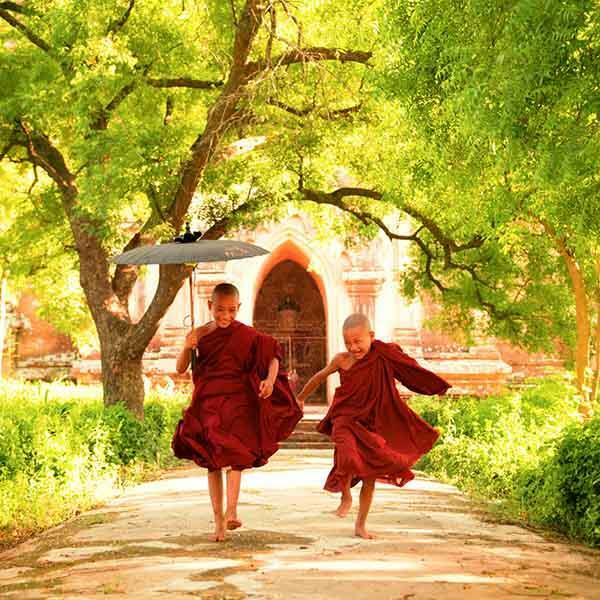 Trek the mountains of Myanmar and discover the gold-encrusted wonders of Yangon, Bagan, Mandalay and Inle Lake with a private guide, before relaxing on the powder-white beaches of Ngapali Beach. 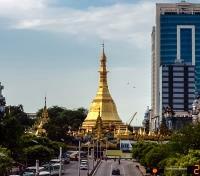 This is the ultimate tour of Myanmar. From enjoying tea time with a Shan family to tasting the flavorful street food of Mandalay and exploring hidden markets usually off-limits to western tourists, your team of expert guides and private drivers will take you deeper into Myanmar's most captivating sites. Discover the proud country that's been shrouded in mystery for centuries and explore some of Buddhism's most sacred sites. Fly from Yangon to Mandalay. Flight time is approximately 1 hour and 25 minutes. This tour is the perfect introduction to Mandalay. 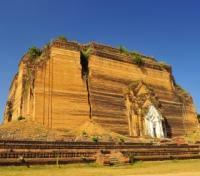 Start at 2 pm with the Mahamuni pagoda and have a look at this century’s old Buddha statue originating from Mrauk Oo. 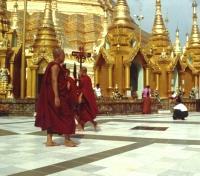 It is a very lively temple compound where men are sticking gold leaves to the Buddha statue. 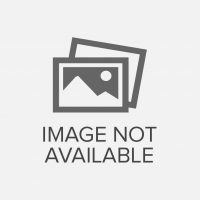 The Mahamuni is also an excellent place to shop around for the perfect Buddha statue (bronze or wood). Can’t find what you are looking for? Find a marble statue at the next stop which is the marble carving street. 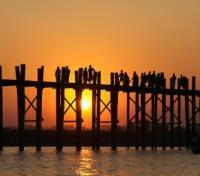 The old capital of Amarapura is a quiet village where you hear the sound of the weaving machines. Walk through the famous Mahagandayon monastery complex with hundreds of monks, visit a 100 year old weaving vocational training institution and walk over U-Bein Bridge where we taste a sip of Mandalay rum which has been produced since 1886! 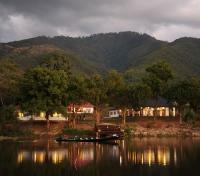 The Rupar Mandalar Resort is a romantic boutique hotel in an exotic atmosphere surrounded by nature. 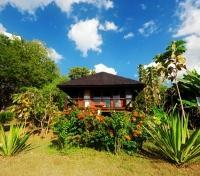 The property is located 1 hour drive from the International Airport and a 15 minutes’ drive from the Railway Station. 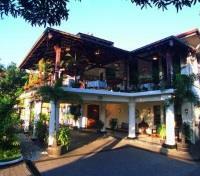 The hotel is equipped with modern facilities including a swimming pool, tennis court, and a health and beauty spa. Fly from Mandalay to Bagan. Flight time is approximately 30 minutes. 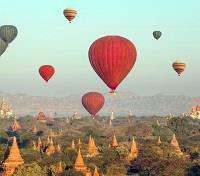 One of the many highlights when visiting Myanmar is taking a hot air balloon ride. In the early morning, before sunrise, you will be picked up at your hotel and driven to the launch site for a spectacular hot air balloon ride over the temple zone in Bagan. The mostly British balloon pilots are operating each balloon under the highest UK safety standards and the views you will get are breathtakingly spectacular. After floating in the air and following the wind you will land safely and be welcomed back on the ground by a smiling crew serving cold champagne before taking you back to your hotel. Please note, this is optional and is not included in the tour price. This is an ideal excursion in Bagan when you feel like you've seen most of the temples (or at least enough) and also want to discover a bit more of the Myanmar countryside. Go by private car to Kyauk Gu Umin cave temple that rarely sees foreign visitors. Continue to Pakkoku and visit a local slipper factory, the market, and see where the famous Pakkoku blankets are made. A private boat is ready for you at the jetty in Pakkoku for a leisurely two hour trip downriver while lunch is being served on board. In the afternoon your guide and driver will take you to see local village life in the dry zone and later in the day, visit a lacquer ware workshop in Myinkaba village. 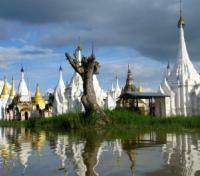 Transfer from Inle Lake to Kalaw with a private vehicle, driver, and English speaking guide. The transfer is approximately 2 hours. 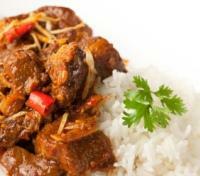 Enjoy a dinner of Shan and Nepalese food at the local restaurant Seven Sisters. 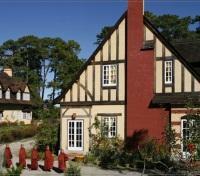 The Amara Mountain Resort is located on a hill, on the outskirts of Kalaw. It takes about 15 minutes walk to reach the center of Kalaw. The Heho (Inle Lake) airport is 45 minutes drive from Kalaw. 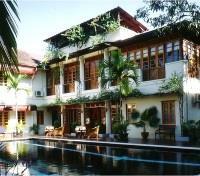 The lobby and all the rooms have genuine British colonial-style that is mixed with Asian features. All comfortable Deluxe Rooms in the Resort are equipped with an open fireplace and bathroom that is made of marble and wood. There are a saloon and a separate dining room, where the traditional Myanmar or European food is served. The Resort Restaurant is situated on the terrace, where the guests can see a wonderful view of Kalaw while enjoying the food. 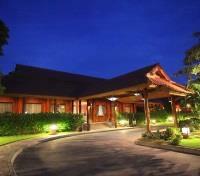 There are a park-like garden and a 9-hole golf course in the Resort area as well as Spa facilities. Certainly the most fun way to arrive at the lake! From Kalaw or Pindaya, drive by car to the starting point of this leisurely bike ride from Thaung Lay Lone to Indein. A 3 hours bike trip – mainly flat – passing sugarcane and garlic fields, Khaung Dine village with some beautiful views on Inle Lake. On arrival in Indein, visit the famous ruins and continue by motorboat to your hotel. 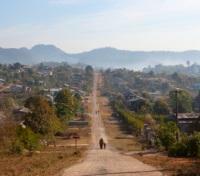 A fun and easy way to start your Shan State adventure. As described in many books, the Shan culture is very interesting and rich and especially in Nyaung Shwe you still get a bit of the feeling of the former Shan kingdom of Nyaung Shwe. Begin with a visit of the Buddha museum which is housed in the former “Haw” (palace) of the last Shan prince of Nyaung Shwe (Mr. Sao Shwe Thaike, who later became the first prime minister of Myanmar after independence). Enjoy a nice Shan lunch at Little Tree House restaurant and then continue the tour to the local market looking for some traditional Shan cotton and Shan traditional dresses. A visit to the ancient teak wooden Shwe Yan Pyay monastery with the oval windows gives the opportunity for some great pictures. You will be peddled around some small canals and pass floating gardens in a small wooden boat for about half an hour to see more of the local Shan life from the water. 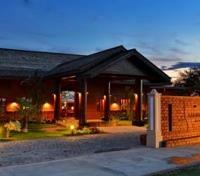 End the tour with a visit and some wine tasting of the excellent wines at the Red Mountain winery in Nyaung Shwe. 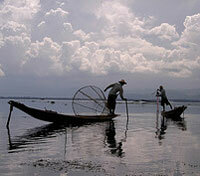 Fly from Inle Lake to Ngapali Beach. Flight time is approximately 1 hour. Bayview Resort is located on the idyllic Ngapali Beach in Myanmar's Rakhine State - its coastline forms part of the Bay of Bengal. The resorts' Deluxe Bungalows and guestrooms including suites are all situated either directly at the beach or in a beautiful exotic garden under countless palm trees. 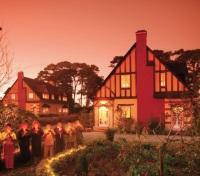 The award winning resort offers a wide range of sport activities, a massage and beauty center. Fly from Ngapali Beach to Yangon. Flight time is approximately 1 hour. 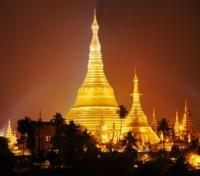 Enjoy the usage of a private vehicle with English speaking driver and guide at leisure for a half day in Yangon.